The CM clutch and brake design offers the same features of the CB unit but has ventilated friction-shoe assemblies where moderate slippage is encountered between the element and drum. Oil States CM technology is the preferred choice for the marine industry, and the CM elements are offered in five sizes. Oil States is one of the leading providers in new and re-manufactured CM elements. Contact the factory about the CM re-manufactured core program to reduce cost on future rebuilds. 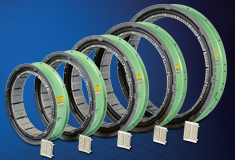 Industry leader in re-manufactured CM clutches and brakes. New and re-manufactured options offered in all sizes.